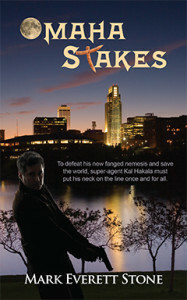 Omaha Stakes ($15.95, 328 pages, ISBN: 978-1-60381-931-2), is Book 5 of Mark Everett Stone’s popular urban fantasy series featuring a super-agent employed by the Bureau of Supernatural Investigation. Next up: The Spirit in St. Louis and two sequels to The Judas Line. Books in Motion has issued audiobooks of Mark’s first four BSI novels, Things to Do in Denver When You’re Un-Dead, What Happens in Vegas, Dies in Vegas, I Left My Haunt in San Francisco, and Chicago, The Windigo City. They plan to tape the entire series. Mark’s first novel, Things to Do in Denver When You’re Un-Dead, won the second place Forward Literature Award for Humor and was one of seven titles nominated for ForeWord Magazine’s debut fiction award, ForeWord Firsts. The Judas Line was a finalist for ForeWord’s Book of the Year Award and earned a starred review in Publishers Weekly. Maydock has infiltrated BSI Security and can monitor Kal’s every move, so until Ghost can repair the breach, Kal has no choice but to travel to the Heartland with no team backup and only those items he can carry. While Kal dances to Maydock’s tune, Canton and his team covertly follow as close as they dare, realizing that if they are caught, they will trigger Maydock’s epic murder spree. Even as Kal is put through his paces, he uncovers corruption so insidious it tears at his fragile sanity. With the odds stacked so heavily against him, how can Kal possibly vanquish the most powerful being he has ever encountered? With no further comment, I smashed my smartphone against the corner of the chest of drawers, sending shattered plastic and delicate components flying. Lowenstein’s head fell to the floor with a dull thud and rolled to a stop next to Nihsen’s size nines. I put the cheap phone to my ear. My skin began to crawl. I knew what would come next, but remained silent. “He is three blocks away. Two blocks directly south, one directly east. A warehouse under renovation and is currently unoccupied by human prey. He is on the roof. You have ten minutes. Come alone or he dies. Oh, and destroy the phone.” Click. I didn’t think twice. The cheap cell joined the detritus of the smartphone as shards of plastic and paper circuitry rained down upon the carpet. “What are you doing?” shouted Nihsen, grabbing my arm. He wouldn’t let go. Damn, but he packed some muscle beneath that tubby exterior. “Check the Picasso,” I said, pointing to the crudely rendered, spear-wielding Spaniard. “Camera is in there somewhere.” While everyone looked toward the print I hightailed it out of there, taking the stairs instead of the elevator. My sneakers hit concrete at a run and the too-humid air walloped my face like a wet slap. The car was close, but so was the warehouse. I briefly considered raiding the Hyundai’s trunk but realized that time was short and I had plenty of lethality hidden about my body. At least, I hoped so. Three blocks passed in a blur; the only sound I was aware of was the flapping of my trench coat. I spied my destination. It was the only building large enough to be called a warehouse—a three-story brick monstrosity surrounded by shorter structures, equally old and worn. An ancient, weathered Gulliver surrounded by storefront Lilliputians. Most of the small windows decorating the warehouse were either boarded up or broken. As I approached, I became aware of an aura of decrepitude and abandonment that practically shone from its crumbling russet façade. If it was being renovated, it must’ve been from the inside out. I knew it was a trap. Had to be. Maydock was toying with me, putting me through my paces for his cruel amusement. It would be up to me to spoil his fun.